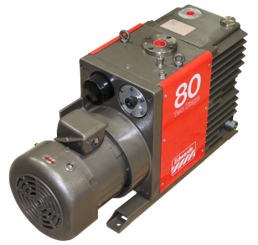 The Edwards E2M8 is a dual stage rotary vane pump commonly used in a wide range of vacuum related industries. It incorporates forced oil lubrication to prevent oil starvation during high gas loads as well as an integrated gas ballast to assist with troublesome applications, such as those with condensable vapor content. For applications requiring inert fluids (e.g. Oxygen compatibility), the E2M80FX is used, containing PFPE oil instead of a standard hydrocarbon based fluid. The E2M80 is commonly configured for the integration of a mechanical blower, such as the Edwards EH500, which will greatly increase pumping speed. MF Outlet Mist Filters – capture exhaust oil mists keeping them out of the exhaust system. The Edwards E2M80 has the following specifications.